Latest post Tue, Jun 19 2018 5:28 AM by Job ter Burg. 3 replies. Title says it all. What are the best project settings for footage shot on an F55, 4K in 2.35:1 aspect ratio? I don't want to lose any quality during the boot off to color after the cut is complete so I know this part is very important and I don't want to mess anything up. I know the resolution for a 4K 2.35:1 aspect ratio is 4096x1679 but in the 4K project settings there are only a few resolution options and none are 4096x1679. When I try to create a custom resolution it gives me the error message: "Incorrect value for width and height. The values must be multiple of 2. Minimum width: 256, minimum heightL 120, maximum width and height: 8192". What is the best way to go about setting up my project? I've editing tons of projects in standard 1920x1080 HD before but nothing 4k that is why I am asking. I work off my 13-inch MacBook Pro with a 2.9 GHz Intel Core i5 Processor if that helps. I am also using Avid MC 8.5.3. Couple of things. In Digital Cinema, “scope” is defined as ~2.39:1. Even though many folks still refer to this a 2.35. So the 4096x1716 format matches that exactly. More important is how things were shot/recorded. Unless they used anamorphic lenses, chances are that thay actually recorded full sensor (4096x2160), with the intent of cropping off the top and bottom in post. Usually, you’ll want to preserve the full sensor image, as it gives you (or the colorist and DP in post) the ability to vertically adjust framing/headroom. Also, you mention turning over to color later. Do you know what they expect you to deliver? 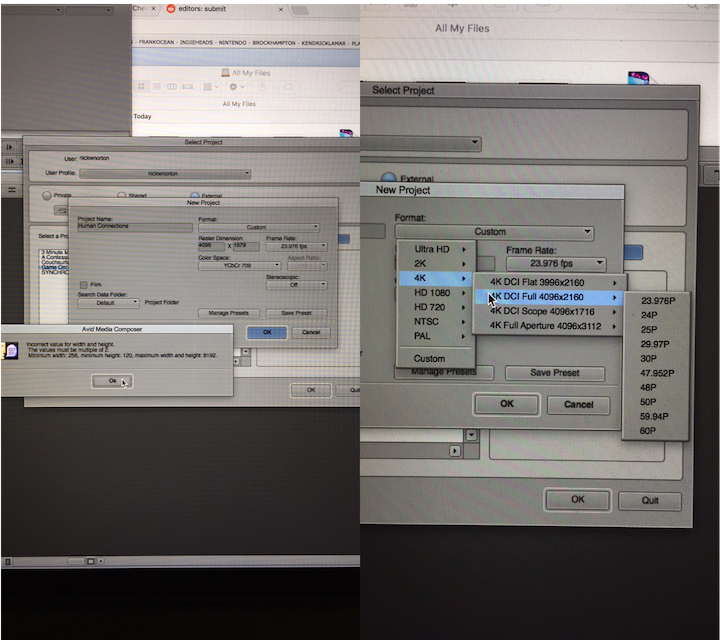 Most common workflows do Avid editorial in HD downconverted dailies in Rec709. After locking the cut, a post house then conforms the cut on whatever their system of choice is (they will usually conform inside the package they also use to grade in), using color space setups as required. I was wondering if you can help me too. I know the cinemascope is defined at 2:39.1. What format in the start project window am I going to choose to get that final resolution export? I don't want apply any mask effect. I tried to custom 2:35.1 but Avid don't allowed me. I will also work in Proxy to relink at the original AMA. Can I reformat to crop the stretch image on the timeline? To start what should I do best? Nothing wrong with masking. Gives you the ability to vertically Reframe. You can always crop off the masks when outputting to DCP or other deliveable. Also: DCI specifies “scope” as 2048x858. If not 16:9, I’d use that.